Despite its age (this model was produced since 1960s http://www.cona.co.uk/about.php), I think it looks quite stylish and is well made. It's using a glass rod filter and is good that I don't need to worry about washing the cloth filter. I thought without using any cloth filter, there would be quite some sediments at the bottom of the coffee. However, to my surprise, there's really not much sediments at all. The flat base of the bottom flask can also allow direct sitting on any town gas stove. Brewing temperature can easily be controlled at between 75'C and 93'C (but the bubbles coming up the tube would be too large) depending on flame power. 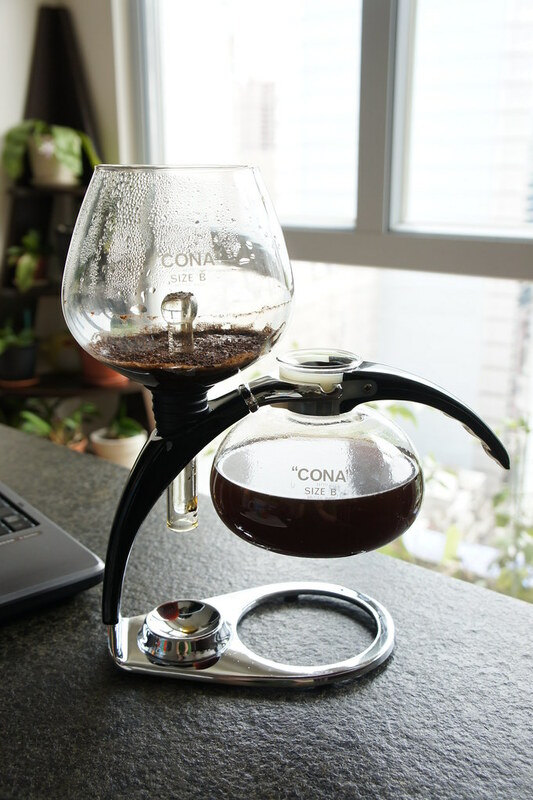 I had also read some articles about the strength of the glass used by Cona and I could spray water onto the lower flask (do it at your own risk!!!) to cool it without worrying about cracking it. In 2-3 seconds time, the coffee is sucked back to the bottom flask quite vigorously due to the rapid cooling and brew time thus can be accurately controlled. The worst thing is that there's half the flask of water retained in the bottom flask (due to the "short" tube of the upper flask) but I'll try to see if I can cut out part of the rubber to let the tube sit deeper.